Located in the vibrant Norton Commons neighborhood, this stunning custom-built Cape Cod has been immaculately maintained, featuring only the finest finishes and details throughout the home's three spacious levels of living space. 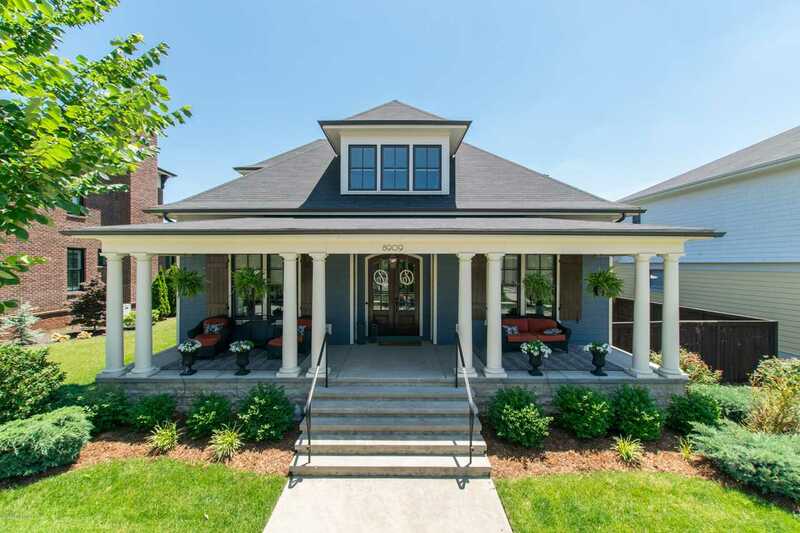 Beginning with a picturesque columned front porch with wood plank ceiling and ample room for seating, guests first arrive into the designer foyer, featuring gorgeous French door entry, crown molding and rich hardwood floors that continue throughout the first floor. The home's desirable open floor plan draws guests further inside to the stunning living room with exposed beam coffered ceiling, gas fireplace and unique barn door built-ins, before leading into the gourmet eat-in kitchen with windowed dining area. The Tuscan-inspired kitchen is the perfect stylistic meeting of farmhouse and luxury, specially finished with beautiful granite countertops, custom cabinetry, spacious eat-in island, subway tile with herringbone detail, dual dishwashers, stainless steel appliances and an oversize wet bar with built-in ice maker, perfect for easy entertaining. The dining area features elegant wainscoting, ample natural light with large windows and immediate access to the deck and patio. The first floor master suite features spacious master bedroom with oversize windows, walk-in closet and luxurious master bath with soaking tub, glass shower with custom tiling and his-and-her vanities with marbled countertop. The first floor is complete with screened-in porch with wood plank ceiling and recessed lighting, powder room, convenient mudroom and large laundry with additional storage. The second floor features two spacious bedrooms with Jack-and-Jill bath, third bedroom with en-suite bath and unique loft area with vaulted ceiling, perfect as a study area or shared living space. The fully finished lower level includes family room, custom designed wet bar with whiskey barrel sink, granite countertop, columned eat-in island and beverage refrigerator, billiard room with hidden playroom tucked behind built-in bookshelves, full bath, additional bedroom and room for additional storage space. The home's exterior features spacious pergola porch, grilling patio with brick encasement and dining area, three-car attached garage and fully fenced side yard with exceptional green space for the neighborhood. SchoolsClick map icons below to view information for schools near 8909 Coltsfoot Trace Prospect, KY 40059.